Alice Munro's new book, The View from Castle Rock, is a delightful fraud. Whether through failure of imagination on her publisher's part, or a lack of confidence in the reader, or a shrewd authorial gambit, it is offered as a book of "Stories", the author's eleventh. But it is something else, a major achievement, and an exciting revitalisation of a somewhat exhausted genre. Resounding flyleaf rhetoric issues a denial: "So is this a memoir? No." Well, yes. It is. It is a memoir as only Alice Munro could write it. Are there stories in it? Is there fiction? Well, of course. Show me a memoir that isn't bustling with fiction. The difference is, the fiction here is neither subterfuge nor self-enhancing. It is an essential element of an intimate past, both ancestral and remembered, that is transformed by the author into shared revelation. Does knowing this make a difference? The answer is an unequivocal no; and yes. The book is pleasurable in no direct correlation to recognition of type; but yes, it is a remarkable and enduring achievement in good part because it hijacks the conventions of a tired genre to become something splendidly original. The reviewer might find this distracting, but for the critic, and for many readers, it is of singular importance. Nothing separates reviewers and critics like a new book by Alice Munro. The former, exercising taste in the present tense, is challenged to find fresh accolades to heap on the author. The latter, whose job is the exercise of judgement informed by an educated imagination, who writes with a sense of historical context, is charged with the task of explaining 'why'. Why is Munro so good, how does she do it, what makes her writing so stunning in its casual complexity, its intense directness? One has only to read the cover blurbs on The View from Castle Rock to understand the problem. "The smallest moments contain the central truths of a lifetime" (Maclean's). "Read Munro! Read Munro!" (New York Times Book Review). Hallmark insight or sophomore cheer�neither does much to inform the reader, to open the text. On the back flyleaf, we learn that Munro "was included in Time magazine's list of the world's one hundred most influential people, and she has been mentioned as a potential winner of the Nobel Prize in Literature." What were the criteria? Mentioned by whom? The best blurb simply acknowledges, "This collection of wonderful fiction . . ." But what makes a Munro collection wonderful, influential, filled with seminal truths, and so eminently readable? All the Munro commentaries and criticism I have encountered over the years, in the academic press and in popular media, seem to let her achievement slip through as if textual analysis and critical judgement were unconscionable indiscretions. She is good because she's good; she is the best because no one is better. And�because there is no other phrase for it�she is Alice Munro; but this is a bit like saying Shakespeare is Shakespearean. So, what is it she does? It is commonplace to hear said, sometimes without the qualifier, that Munro packs nearly as much into a short story as Tolstoy or Faulkner do into novels. In part this may be an attempt to valorise the short story form in the hands of a master. But how does she create the illusion? Essentially, it is because time in Munro's writing is spacial. Her text overrides rules of chronology, the norms of narrative continuity. Stories do not develop or evolve, but, like a shipwreck rising magically out of the depths, they emerge�the high bits first; confusing bits declare themselves; surfaces connect, imply places unseen; the entire vessel floats, and still the sleek and ravaged hull beneath the waterline is secret. Munro trusts language. It is enough that we share it in common. She does not seem to be driven to make it her own. Listen: "I felt first amazed, then betrayed, then excited and hopeful, my thoughts running on to advantages to be gained for myself, in this new situation." This is clear, uncluttered prose. Yet so precise, so in control of shifts in the speaker's mind, it is as if you are going through the same transitions, sharing the dubious epiphany. There are occasional flourishes of course. Munro's prose can be disarming, extremely witty, sometimes ironic, sometimes mysterious�but always direct and accessible. Reading her is like remembering lives of one's own. The opening sections of The View from Castle Rock are particularly powerful as the narrative reveals glimpses into the procedures of emigration and settlement: time is literally spacial, place is actually linear. 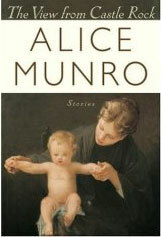 Describing their foreshortened lives, as her forbears move from the Ettrick Valley south of Edinburgh to familiar territory north and west of London, Ontario, where the author-narrator grew up, Munro shares with her readers a temporal perspective apparently from outside the text, a god's eye view, as it were; all is known from the beginning and still the universe unfolds chronologically, shaped by the creator's imagination. And what she imagines grows out of actual research into family history, the documented past of one branch of her family. This means she is working under different imperatives than in her previous writing. Time is not only determined by narrative design; the narrative is also determined by historical time. A first, perhaps, in the Munro canon: the fiction is a delivery system. She declares herself trying not only to create something aesthetically complete but to share a sense of personal completion. Another first: authorial personality is an explicit part of the package. Memoir. In re-creating her Scottish ancestors from the bone fragments and dust of documentary evidence, Munro does a deceptively innovative thing by resisting the call to mythologise. She both distances herself from them and connects by repeating almost as mantra their genealogical position while at the same time providing intimate details of their invented lives. Aboard ship from Scotland to Canada, we find a mischievous toddler, as a little sister is being born, confronting Old James, his grandfather, "his sense of grievance and importance absolute as the child's own. His nature hungry, angry, oppressive. It is Young James' first conscious encounter with someone as perfectly self-centered as himself." Pages later, a graveyard within sound of Highway 401, south of Milton, Ontario: "Old James is here." And the infant who was born at sea died an old woman, but her brother "Young James was dead within a month of the family's landing at Quebec. His name is here but surely he cannot be." Brief moments and entire lives play against each other, echoing. The little boy's older sister, who cares for him on the ship while their mother is indisposed, has never in her life talked to a stranger and seems a lost soul, but in a graveyard marker becomes wonderfully redeemed. Here is "the grave of Little Mary, married after all and buried beside Robert Murray, her husband. She and Robert did not have any children together, but after Mary's early death he married another woman and by her he had four sons who lie here, dead at the ages of two, and three, and four, and thirteen. The second wife is there too. Her stone says Mother. Mary's says Wife." Other novelists and memoirists have conveyed the transition from myth to history to memory as they articulate the ancestral past of their characters. But Munro makes the past, in brief glimpses and contemplative asides, immediate, authentic, and as fleeting as the present moment. When past and present merge in the life, as well as the mind, of the narrator, Munro's instinct for busting the constraints of temporal sequencing kicks in. She, her 'character', has been allied with the reader from the authorial note at the book's opening, but halfway through, in a chapter or segment ('story', if you prefer) called "Working for a Living", she boldly asserts herself as amanuensis in her own creation. For the rest of the narrative, she animates a self-reflexive voice, telling stories that weave together intimate and intricate details of her family, the community, and the times, into a tapestry where growing up to become herself, the woman writing it all down. And that is Alice Munro's genius. Words mediate between parallel worlds. It is like a melding of minds: she uses pellucid prose and the convolutions of narrative time to inhabit the reader's consciousness with such fierce and subtle complexity, the two worlds merge. In the radical form of The View from Castle Rock, she proves herself once again one of those rare writers whose work changes the lives of her readers. If this is her last book, as she has suggested, it is possibly her best�at least for Canadian readers, for reasons extending beyond the text. When we seem to be bobbing about on the surface of time, losing grip on our history, our cultural heritage, it is good to visit where we come from, to know who we are, and to do so in perfect style.